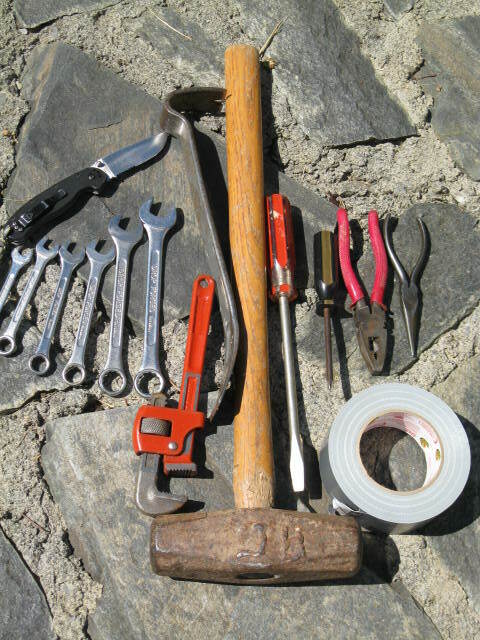 Some essential, multi-purpose tools for your tractor’s toolbox. Ask five farmers what tools are in their tractor toolboxes and youâ€™re likely to get five different responses. The answers will vary according to the time of year, personal preferences and the job that tractor is tackling. At minimum, however, certain multi-purpose tools can come in handy in a broad range of farming scenarios. A well-equipped tool box can save the farmer a long hike back to the barn. You might not be able to splice a worn baling belt in the field, without the help of a bench vise and electric grinder. Changing a massive tractor tire requires a heavy-duty jack, which may take up too much room in a toolbox — if it fits at all. But a lot of trouble in the field can be resolved with basic tools found in any home garage. Hereâ€™s a short list. Tighteners: Almost any tractor operation, from bush-hogging to baling, involves major vibration. Eventually that means loose nuts and bolts.An adjustable wrench will come in handy for large bolts. An assortment of open and socket wrenches will ensure a fit for smaller items that come loose. Before stocking the toolbox, however, you need to know whether your tractor uses standard or metric measurements.Â In some cases, engine parts require one version and tractor attachments another. Slot and Phillips screwdrivers are also essential — for tightening the screw on a hose-clip, for example. Extractors: When working in tall grass or brush, tractors encounter nasty surprises. Loose wire, rebar, even vegetation itself can wrap around machinery. Small pry bars, pliers, wire-cutters and knives can come to the rescue. Muscle: A sturdy hammer has multiple applications in the field.It can bend back a piece of rebar wrapped around an axle. When heavy vibration jolts a tractor part out of alignment, a good whack can often straighten things out again. Â Livestock producers know that a hammer blow to the head of a seriously injured cow or sheep can save the animal needless suffering. Duct tape:Â Donâ€™t forget the king of multi-tasking.  Duct tape can temporarily seal a leak in a radiator or hydraulic hose and hold together frayed belts. 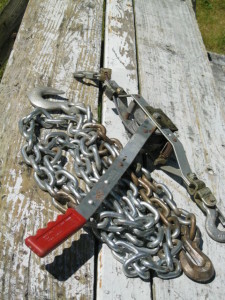 An example of specialized “muscle” tools (come-along and chain). A tractor may not be cutting grass in winter, but it rarely lies idle in the cold season, when farmers catch up on soil amendment tasks, fencing repairs and stump pulling, to say nothing of using the tractor to plow out the driveway. A folding snow shovel is a useful addition to a toolbox in winter, because even four-wheel-drive tractors can get stuck in snow. Winterâ€™s short daylight hours often cause the farmer to finish his field tasks in low light. A flashlight in the toolbox can come in handy. Warm weather additions to the toolbox include cans of soda or bottles of water, to keep the tractor operator hydrated under the baking sun. And the insect repellent sprayed on exposed skin before the farmer headed off to cut hay will almost certainly need replenishing before the job is done. Bad things can happen in the back forty. A cell phone added to the tractor toolbox before the start of any field work can literally be a lifesaver. A basic first-aid kit makes sense, too. Even a minor wound can get infected, unless a Band-Aid is on hand to minimize exposure to the dirt kicked up by tractor operations. And be aware of the health applications of duct tape — as a tourniquet or component in a makeshift splint. Any combustion engine poses fire risks. Consider adding a small fire extinguisher to the mix. Some will say this list is too short and should include such items as grease guns and hitch pins. Others will consider the number of suggestions excessive. This list is intended merely to get you started. It takes only a little forethought to tailor your toolbox contents to your individual needs — and save you costly down-time in the long run. What’s in yourÂ Tractor Toolbox? Variant health conditions can affect the muscles that can slow the flow of blood, cause erectile disfunction. There are variant effectual remedies approachable nowadays. Thousands of consumers order online such medicines like Kamagra. A lot of customers regard about dosage for cialis. Now many patients search for the exact keyword ‘cialis dosage 20mg‘ on the Internet. A number drugstores describe it as cialis 20mg dosage. The most common sexual disorders in men are erectile malfunction and inhibited sexual desire. Sexual problems mostly signal other health problems: sexual hurt or erectile disfunction may hide a severe health problem such as diabetes. What can you tell a doctor before taking Kamagra? Online physician services are the only safe edition if you want to purchase medicaments, like Kamagra, online.